As I mentioned in an earlier blog, my husband & I recently headed off to L’Isle Sur La Sorgue for a few nights to celebrate our 25th Anniversary. One of the things we were really looking forward to was the chance to spend as long as we liked on the Sunday morning fuddling around the wonderful antiques market that sets up alongside the river in the town. Now the two of us, an antiques market and no children is a potent mix and it goes without saying that there was every chance some new little delight would find its way into our suitcase for the trip home. On the day we visited the market was superb. The sun was shining and there appeared to be even more stalls than we have seen there in the height of summer. We cycled in from our hotel, leaving our bikes in the park by the water-wheel and after a slow breakfast in the ‘Café de France’ we got to work. It was almost as if the stall-holders knew we’d be there – as so many of them had items that I could easily see gracing either our house or garden, bringing an element of French style to our Dartmoor home. 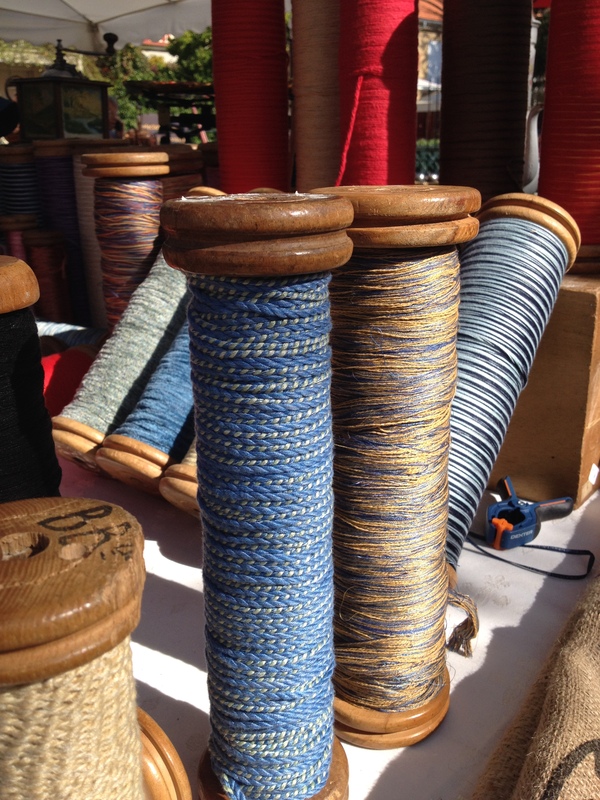 Then sometimes even the simplest, most unexpected of items create a striking display, such as these brightly coloured bobbins of thread – oh how I wished I had an set of old haberdashery drawers to show them off!! Some of the smaller items though were more difficult to ignore – I could easily see a collection of old steel boules sitting in large bowl on the table in the front room or a set of old coat hooks looking great in the hall, particularly hung with one of the lavender bunches found on the stalls in the main market. 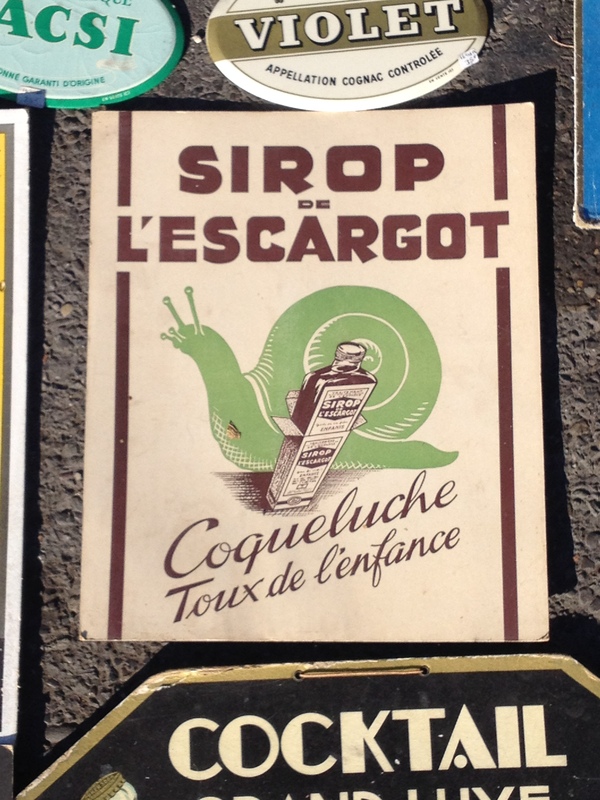 An old enamel advertising sign would also be a great addition to the kitchen – although I was sad to see that the ‘Snail Syrup’ sign was no longer there – I should have grabbed it when I saw it earlier in the year. But then our eyes were drawn to a large set of scales with a heavy, black cast-iron base and gleaming brass pans, together with a stunning collection of brass weights all set into a solid block of wood. I love my kitchen and for a while we’ve had an eye out for a nice old set of scales, yet nothing had really grabbed us until these. The cast base declared that the scales could weigh up to 10kg and the weights were complete from 2kg to a tiny 1 gram, all having their own space, turned into the heavy wooden block. They were just what we had been looking for and that was it – they were just going to have to come home with us. The stall holder was helpful and after a little bit of haggling a price was agreed – it was only then we remembered that we only had our bikes. Now if I mention that we had also bought 14 metres of heavy upholstery fabric then you can imagine the predicament we found ourselves in – the block of weights alone was just under a stone in weight – add in the scales, the fabric and a few other smaller (but heavy) purchases then actually a table would probably have been lighter!! To say that the cycle back along the busy road to the hotel was a bit wobbly would be an understatement, but somehow we managed it without the bags, bikes or us falling apart!! Looking back on it now – that was the least of problems, which we realised as we came up to the Security check at Marseille Airport. Needless to say we had packed very carefully, the hold bag came in 200g below maximum weight and our carry-on bags were packed to bursting, so when I saw the image of the weights in my rucksack on the x-ray screen it quickly became clear that the bag was going to have to be thoroughly checked. I have to say that the Security staff couldn’t have been nicer as they pulled the weights out and handed them around. We had a nice chat about where we’d bought them and how much they had cost – although I think they were rather perplexed at why we would want such an old and possibly inaccurate set of weights to use at home. Eventually though they declared the weights to be a dangerous item and as such announced that they would have to go in the hold. So then began my red-faced walk of shame, back through the sniggering and intrigued snake of people waiting to have their bags checked, out through the door and back to the check-in desk, to register my bag as additional hold-baggage. Of course I had to pay an excess fee, which bizarrely ended up being the same amount I had managed to save on the cost of the scales by haggling………..
I’m pleased to say everything arrived home safe and in one piece and the excess baggage fee was worth it as the scales and weights look just as good as I had imagined they would and I have to smile every time I look at them ……….. particularly as the maker’s address in Rouen now seems to be part of a popular nightclub – bang went my romantic ideas of an aged old shop-front and well-established quincaillerie!! A few weeks on and we’re already plotting another trip to the markets – but thinking about it next time perhaps we’ll take a van!! !